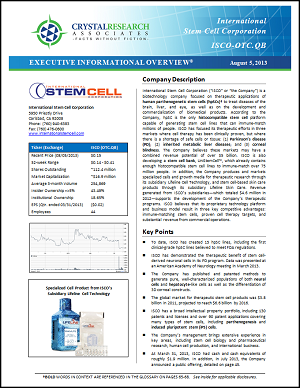 International Stem Cell Corporation (“ISCO” or “the Company”) is a biotechnology company focused on therapeutic applications of human parthenogenetic stem cells (hpSCs) to treat diseases of the brain, liver, and eye, as well as on the development and commercialization of biomedical products. According to the Company, hpSC is the only histocompatible stem cell platform capable of generating stem cell lines that can immune-match millions of people. ISCO has focused its therapeutic efforts in three markets where cell therapy has been clinically proven, but where there is a shortage of safe cells or tissue: (1) Parkinson’s disease (PD); (2) inherited metabolic liver diseases; and (3) corneal blindness. The Company believes these markets may have a combined revenue potential of over $5 billion. ISCO is also developing a stem cell bank, UniStemCell™, which already contains enough histocompatible stem cell lines to immune-match over 75 million people. In addition, the Company produces and markets specialized cells and growth media for therapeutic research through its subsidiary Lifeline Cell Technology, and stem cell-based skin care products through its subsidiary Lifeline Skin Care. Revenue generated from ISCO’s subsidiaries—which totaled $4.6 million in 2012—supports the development of the Company’s therapeutic programs. ISCO believes that its proprietary technology platform and business model result in three key competitive advantages: immune-matching stem cells, proven cell therapy targets, and substantial revenue from commercial operations. 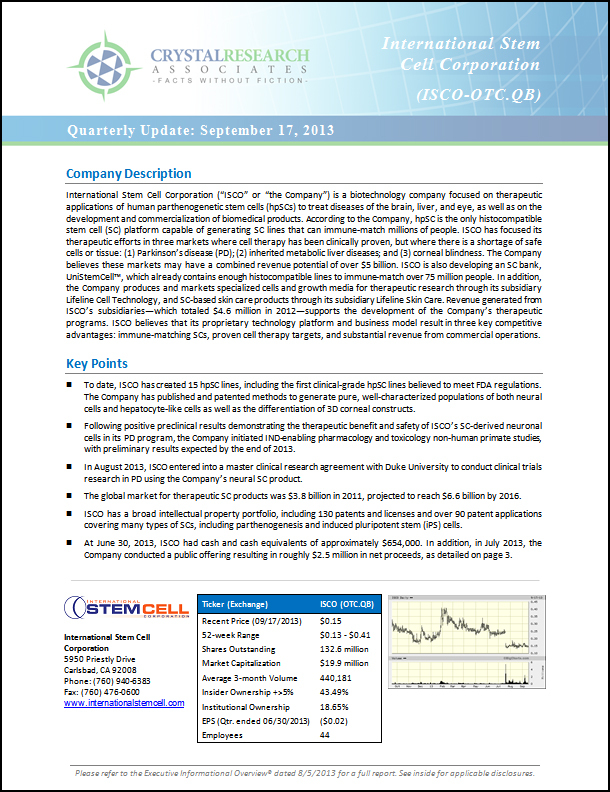 * The Corporate Snapshot was last updated on September 17, 2013.